I got error after upgrading 5.1.2. "c:\BuildAgent\plugins\dotnetPlugin\bin\JetBrains.BuildServer.NUnitLauncher.exe "@@" C:\BuildAgent\temp\buildTmp\tmp22DD.tmp exited with code 1"
Please view settings in attachment. Please select .Net Framework 4.0 in .Net Coverage settings. I changed the Platform as .NET Framework 4.0 and got the same error. Command Args: "x86" "v4.0" "c:\BuildAgent\plugins\dotnetPlugin\bin\JetBrains.BuildServer.NUnitLauncher.exe"
Command Args: "x86" "v2.0" "c:\BuildAgent\plugins\dotnetPlugin\bin\JetBrains.BuildServer.NUnitLauncher.exe"
Could you please check that .Net Framework is the same for .Net Coverage and NUnit Runner? Yes, you are right. I filed this as http://youtrack.jetbrains.net/issue/TW-12320 Sorry for the inconvenience. But how can I fix this build error? Please, provide a bit more details about configuration. What .NET, NUnit versions were used? What NCover version do you use? Could you please check that .Net Framework is the same for .Net Coverage and NUnit Runner? Could you please attach screenshot of build runner settings. And the project is upgrade to VS 2010. 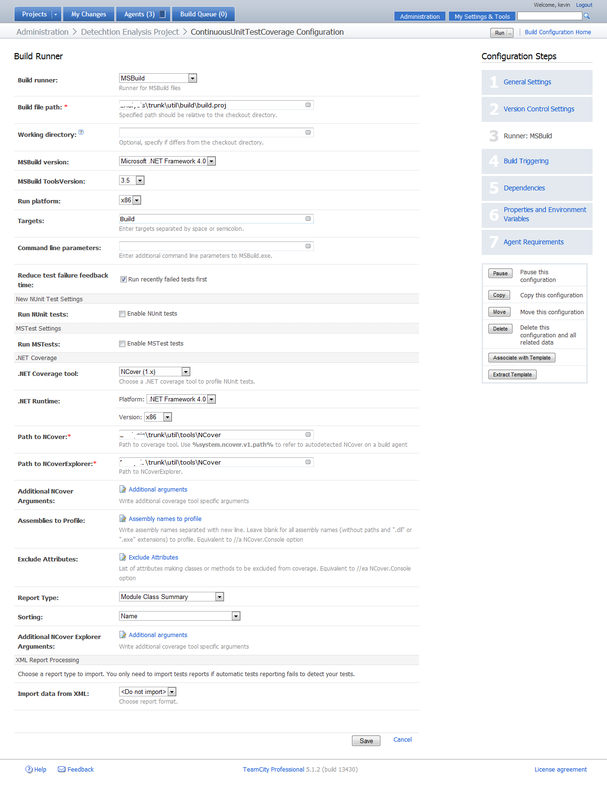 Attachment is the screenshot of build runner settings. You selected MSBuild/Solution runner to use MSBuild 4 with ToolsVersion 3.5. That would mean you will create .NET 3.5 assemblies. In your case I would recommend you to set NCover running under .NET 2.0. All other settings are OK. Will it work with that settings? I've noticed, that you did not enabled NUnit tests in the configuration settings. How do you start NUnit tests? Attach a part of your MSBuild script that starts NUnit. Please change 'v4.0' to 'v2.0' in *NUnitLauncher.exe parameters. Yes, I attached the nunit test in the msbuild scripts. I have changed 'v4.0' to 'v2.0' in *NUnitLauncher.exe. [18:41:10]: Command Args: "x86" "v4.0" "c:\BuildAgent\plugins\dotnetPlugin\bin\JetBrains.BuildServer.NUnitLauncher.exe" "@@" "C:\BuildAgent\temp\buildTmp\tmp5FDF.tmp"
I have upgraded my .net 3.5 project to work with VS 2010, but the target framework is .net 3.5. Are there any setting missing? <NUnitTeamCity> task select .NET framework version based on MSBuildVersion. Please specify 'Runtime' attribute with value 'v2.0'. See http://confluence.jetbrains.net/display/TCD5/NUnit+for+MSBuild for more details. error MSB4064: The "Runtime" parameter is not supported by the "NUnitTeamCity" task. Verify the parameter exists on the task, and it is a settable public instance property. Then I comment out <NUnitTeamCity in my build script and open unit test in build configuration, the build works!!! So is it a bug of NUnitTeamCity task in build script? TeamCityNUnit task select .NET version to run unit tests from current .NET version that is used to run MSBuild. I'll fix documentation to refrect the right attribute name. It's recommended to use NUnit configured from TeamCity ui. Yes, I think the NUnit configure is better.